Here are a few of the pieces I have collected so far. Enjoy! Three glass mice, one needs a bath! Forever amber. 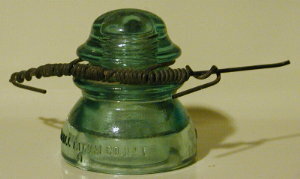 Rusty-colored swirls in insulators are referred to as "amber" by collectors. The 4th piece from the left in this photo has so much amber that it appears opaque in this light. All of these pieces have some nice amber swirling. The center piece is the one that appeared opaque in the photo above. Insulators with this amount of amber swirling are sometimes referred to as "Tiger Striped." 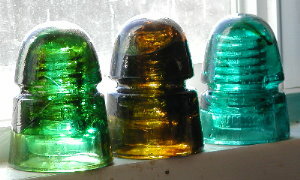 Ruffles have ridges and so do these insulators. CD 154 with part of the wire still in place. Please check back again. I will add more photos from my collection as time allows.